Update: July 28 & 30, August 1, 2, 4, 6, 7 & 9, 2012. "We are overwhelmed and totally blown away by the love from our friends in Mexico City who gave us a record six sold out shows totaling over 100,000 tickets at the Sports Palace this coming August. Never in our wildest imagination did we think we would be posting this news story... TWO more shows have been added to the run!! That's right . . . eight nights in one of our favorite cities with some our craziest, most out of control fans on the planet!" "Again, a huge thank you to all the fans in Mexico and we can't wait to see you in July!" 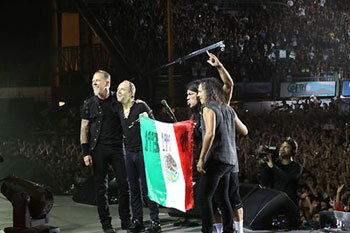 Metallica will be on a Mexican vacation with a total of 6 sold-out shows in a row. Setting a new record on their career by performing 6 times on the same venue. The first time Metallica was in Mexico they sold out a total of 5 shows @ the Sports Palace in 1993 after that the boys played on Copenhagen with a total of 5 shows back in 2009 with a visit to Finland in between.